I enjoyed seeing celebrities (more on that below) - who doesn't? - but for me, the highlight was getting to meet two of my friends for the first time in person. I knew Carol Ford was going to be there; we'd talked about it several times, and she was one of the first people I hunted out. You remember Carol from my interview with her about her Bob Crane biography and through that and some subsequent email conversations I'd gotten to know her well enough to know that I liked her. She was smart, funny, and incredibly knowledgeable about her subject. As it happens, Carol was even smarter, funnier and more knowledgeable than I'd expected, and also something I hadn't expected - tall! I'm six-foot-four, and you can see she was almost a match for me. We had two or three chances to talk during the weekend, and I can tell you that in addition to everything else she's an incredibly nice person who interacted with everyone who came by her booth (and there were many, I can tell you). Bob Crane and his family are very fortunate to have an advocate like her. 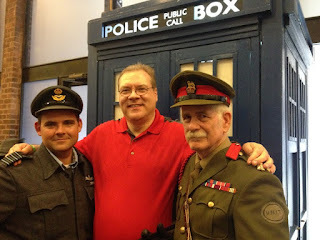 I've mentioned before that the highlight of getting into the classic TV scene as much as I have is that I've had the good fortune to meet, in person and through email, some very, very nice and smart people who've enriched my life immeasurably. As I said, I knew Carol would be there - but on the way to find her, I ran into someone I hadn't known was going to attend. Adam-Michael James, author of the wonderful Bewitched Continuum, who I interviewed last year, and another friend whom I had not previously met. 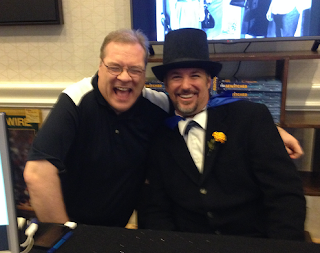 He was delightful as well, and cut quite the figure with a very dashing top hat and cape. A few minutes chatting, and (as it was with Carol) it felt as if we'd been friends for much longer. It was great to see the number of people stopping at the booth to talk Bewitched, and I hope I didn't come across too heavy-handed in telling people they had to buy this book!. I don't think I can stress enough how much fun it was to finally meet Carol and Adam-Michael personally. 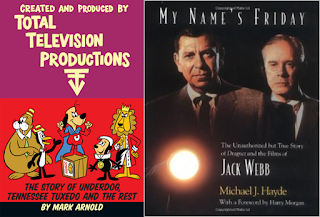 * Don't think I'm prejudiced, though, when I tell you that Bob Crane: The Definitive Biography and The Bewitched Continuum were two of the books on my "Best of the Year" list. 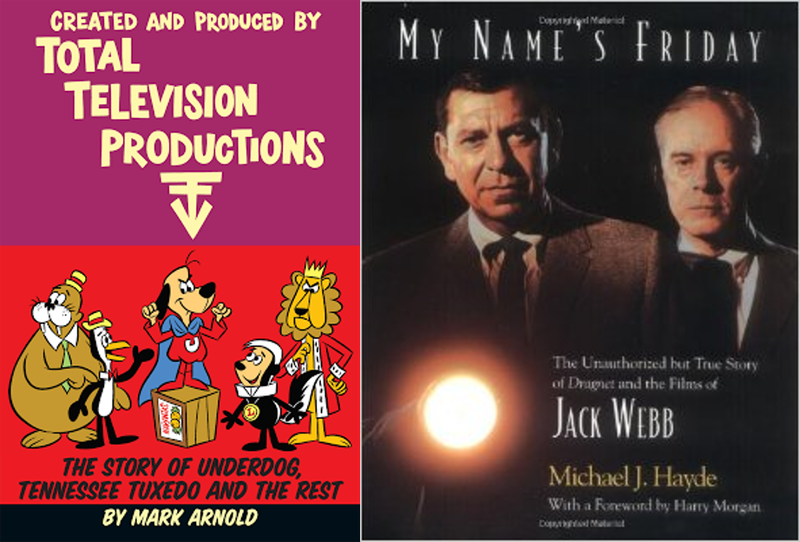 For anyone interested in classic television, pop culture, or just looking for a good read, these books should be on your shelf at home. *And neither of them ran away when I introduced myself, which was a real plus! I guarantee this is not how we got home. One of the best things about being at MANC was the feeling that you were among like-thinkers, that for once you didn't have to explain yourself to others. I told several people about this website, and about the TV book I'm currently working on (note to self: bring business cards next year! ), and not once did I feel like a nut. (At least, any more than I usually do.) Most of the participants were around our age, and if we didn't all have the same favorites, we all spoke the same language. Next year, when I'm hoping to return as a speaker and author, I'd like to cover this not as a fellow fan, but as more of a journalist. I know many writers have written about the convention scene in the past, and we probably don't need yet another article, but I think it's a very interesting, literate group of people. We're all nerds in a sense, of course, and most of us know way too much about certain shows, but it still intrigues me as to why we all gravitate toward this subject. Sure, nostalgia is a big part of it, especially since the world has changed so much from that in which we came of age, but that can't be all there is to it. I try to answer some of that in my upcoming book, and I think it's an endlessly fascinating topic. But then, I would. I had Carol and Adam-Michael's books,but that still leaves a lot of vendors to visit. There were more books, of course, but also magazines, toys, comic books, action figures, DVDs, records, movie posters, and any kind of vintage paraphernalia you could hope for. There was a particular emphasis on items associated with the weekend's celebrities, which meant 2001 posters, all kinds of Laramie and Wagon Train pictures, James Bond posters (two of our female guests were, after all, Bond Girls), and - no surprise - TV Guides. I'd planned on that, bringing my list with me to make sure I didn't wind up with any duplicates, and I managed to score a pretty good haul, for which you, dear readers, will be the beneficiaries. You can look forward to a couple dozen issues popping up over the next year or so, for which you can thank me later. There wasn't possibly enough money in the world to buy all the things one might have wanted, even if you happened to win the lottery. Nor - more important - would there be enough room to store it all, or wall space to hang it all. That's all right; it's just one of the decisions one has to make in life. The fact is, these items stand out because of the memories that are triggered by their appearance. And those memories, pray God, we'll always have. I was incredibly impressed with Robert Fuller. He was clearly the star of the show; many members of the Robert Fuller Fan Club were on hand (recognizable in their cowboy hats), and he was forever posing with them, and with just about anyone else interested in a picture, all the while behaving as if he was having even more fun than his fans. There was a special event on Thursday night which was reserved for him and the fan club members. I didn't see anyone leave the room looking unhappy. What a mensch. We had two encounters with him. The first was on Thursday prior to his meeting with the fan club. We were heading out to grab something to eat, and as it turned out he was walking next to us. He asked my wife if she knew where the bar was, and she pointed the way. Don't mean that in a negative way at all; after a big day of meeting fans, a drink before dinner was probably a necessity. The other encounter was quite remarkable, and very moving. At the Saturday night gala, we shared a table with a large family of three generations. Among them was a young man in a wheelchair, suffering clearly from both physical and mental challenges; a layman like me would have described him, in the pre-PC days, as being severely handicapped, quite possibly from some kind of accident. At any rate, his sister, perhaps not quite 10, had met Robert Fuller at a convention some years before, and for some reason the two of them had hit it off, and he had met with the family several times since, posing for pictures with this girl and her brother. Seeing Fuller at one of the front tables prior to the start of the dinner, she ran over to get him, and Fuller came over, put his hand on the young man, and whispered into his ear that "Bobby Fuller" was there (calling him by name), that he loved him and hoped everything was well. I was already really impressed with Robert Fuller by then, but that made me even more so. As I said, what a mensch. And a word about Robert Conrad, who was a late addition. We'd been told he had been in poor health, that last year at this time he couldn't walk by himself, not without assistance. He looked old, and frail. But he was determined to meet everyone who wanted an autograph or a picture or a handshake, staying past the end of the autograph sessions if there were still people in line. He was happy to meet with and accommodate his fans. He stayed through the weekend, insisting on standing at the Saturday night dinner when he was introduced, even though he didn't have to and nobody expected him to, even though it was a struggle and he couldn't do it without help. He wanted to acknowledge the applause, the people who had come to see him. As he said, "I'm not an antique." Fuller was in rare form, as were Bernie Kopell and Kent McCord when they appeared at the men's panel discussion Friday. Who knew Bernie Kopell had such a bawdy sense of humor? They entertained the crowd, and each other, for an hour, and the personal friendship between the three (especially Fuller and Kopell, and Fuller and McCord) was obvious. In fact, everyone seemed to be having a great time at the convention. My wife mentioned that celebrities probably don't go to them if they don't enjoy such events, unless money talks louder than anything, and that's probably true. Nonetheless, the chemistry between all the guests was perfect; the women's panel, featuring Kathy Garver, Luciana Paluzzi, and Britt Ekland was just as funny and almost as bawdy, particularly Ekland. (Her feelings regarding her ex-husband Peter Sellers were not hard to read.) Paluzzi in particular seemed to be having a ball, often the first one to stand and applaud performers, other celebrities, and the staff. I didn't get a chance to ask anyone, but she must have been a blast to work with. The Thursday night panel was Keir Dullea and Gary Lockwood, the stars of 2001. They, too, were old friends, and their teamwork ran like clockwork. I got to talk with Lockwood for a couple of minutes when he was on his way from the bathroom back to the celebrity area, and he was a pleasure. It was interesting to hear them discussing the movie; they both knew that starring in a film directed by Stanley Kubrick was a once-in-a-lifetime opportunity, and they were both apparently quite aware of the significance of the film as they were making it. Dullea, however, thought the impact would be of the moment; it was Lockwood who, as they filmed it, told Dullea that the movie would be a landmark that would be remembered for decades. 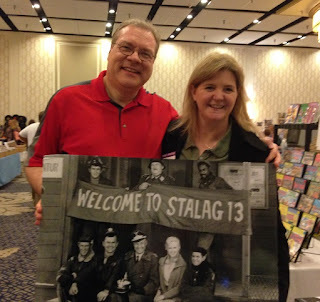 For me personally, in addition to meeting my friends and the rest of the vendors, the portion of the convention that was of the most practical interest was in the seminar room. Joe Bevilacqua's presentation on voice artist Daws Butler was entertaining and informative (particularly when Bevilacqua, a talented voice artist in his own right and protege of Butler, started flitting from one cartoon voice to another, often demonstrating the real personages upon whom the voices had been based. David Krell had perhaps the most informative talk, at least in regards to what I do. He spoke on the year 1962, describing how an original idea to write about that year's baseball season had evolved to discuss the many notable things that had happened that year in politics, pop culture, and history. (The Cuban Missile Crisis, Marilyn Monroe's birthday song to JFK, and John Glenn's flight were only three of that year's events). Krell's talk helped me solidify the structure of my own upcoming book on the relationship between television and pop culture, and to understand why it takes decades to understand the impact of a particular era. The talks were all good, all informative, but perhaps the most valuable information I gleaned from them was that I can do this. I can stand up and talk about these things. Not that I had any real doubts, but this confirmed my feelings. And this isn't meant as a criticism of these presenters, either. It's more a mark of the confidence I have in my own abilities, in my knowledge of the subject and the development of my theories. It was the best of times, it was the worst of times - wait, I got sidetracked there for a moment. What I meant was that it was the best kind of vacation - while it was going on you didn't want it to end, but when it was over, you were ready to go home. 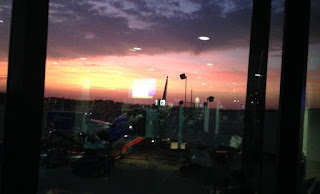 And so, as the sun rose over BWI at 6:30 on Sunday morning, waiting to board a plane that wanted to go on time but had to wait an hour for a spare part, we say farewell to the Mid Atlantic Nostalgia Convention, and farewell to summer, at least for another year. I want to go back as a fan - not only was it fun, but I've found, in a sense, "my people" - the shared interests, the common language, the bonds that seem so difficult to form in this day and age. (Hats off, by the way, to Martin Grams, who does the incredible job of putting this together, year after year.) My intention, however, is to return next year as a participant, trying out my thoughts on the relationship between classic television and American culture. Can I pull it off? Stay tuned and find out. A great recap, Mitchell! Amazing lineup. I'd be interested on your take on the Total Television book...thanks also for the continuing coverage of the Bob Crane saga. Thanks, John - I'll keep you posted, but so far the drawings of the various characters are hilarious! This was a fun read - such get-togethers with representatives from the classic TV of our youth are something all of us should try to attend, as these opportunities sadly won't last forever. Agree completely. When we'd decided to go, I made the point to my wife that we should go on an adventure, since we aren't getting any younger. She wisely pointed out that neither are the celebrities. I wish there were more of them to attend - I'd really like to put one on here in Texas, and I'm now actively trying to identify classic TV fans within a reasonable distance from Dallas. If we can't do our own convention, at least we can form our own classic TV club and get together to talk about and watch them. 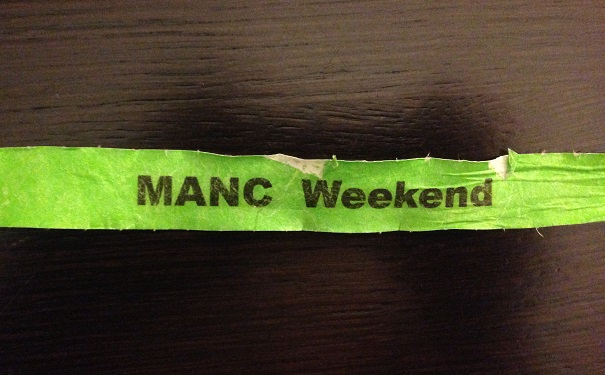 I've been to MANC too--and you're right, it is a special place. That show really feels like a community and too few nostalgia/celebrity autograph shows nurture fans. I didn't go this past year, but perhaps in the future, we'll meet in person at the show. Then I'll get to say "Hey, I met Mitchell Hadley!" BTW: that Dragnet book is the best!